Bert Topham's Castlefield Observatory in Toronto, at the end of its life. Sketch by Eugene Fedorenko (Toronto Centre). 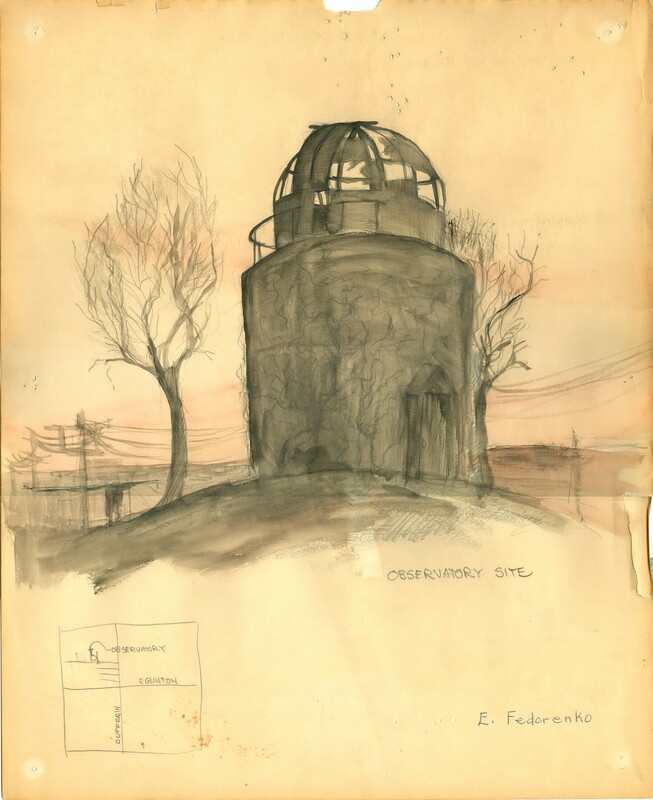 Photos of this observatory from the RASC Archives. A short bio on Bert Topham (1893-1962) appears on page 148 of Looking Up. When I joined the Montreal Centre in 1957, they had only a few months before they purchased Bert Topham's 165mm (6.5) f/15 refractor, equatorial mount, and motor drive, and mounted it in what was to become the Isabel Williamson observatory. I had the use of that fine telescope on many occasions, until vandals broke into the dome and stole the objective. Here's a picture of the Topham refractor in its new home in Montreal, taken sometime in mid-1957. George Wedge is at the eyepiece, and the crowd includes Isabel Williamson, Harper Hall, Frank DeKinder, Ted Morris (solver of Messier mysteries), C.L. Drolet-Bridgen, Don Frappier, and Charles Good.